People are talking about saunas lately, and the incredible health and wellness benefits of heat bathing from home. Can you really improve health and wellness from relaxing in heat? Here are some facts about sauna bathing and how easy it can be to maximize your health in a sauna. Support Heart Health – Cardiovascular health is important; a healthy heart can help avoid risk of heart disease, stroke and more. High heat of the sauna increases circulation, which prompts more efficient nutrient and oxygen delivery throughout the body. Regular sauna use can make a cardiac event less likely. Reduce Chronic Pain – Millions of people suffer with everyday aches and pains. The good news is, using a sauna for just a few minutes each day can target pain where it starts, relieving stiffness and relaxing tight, sore muscles and joints. As high heat envelops the body, achy muscles relax, flexibility increases and pain is reduced. Detox the Skin – Dangerous bacteria and contaminants get absorbed into the skin from the environment, and washing alone cannot remove them. What happens when you lounge in very high heat? You sweat! A deep, regular sweat is a healthy activity, and a smart way to rid the body of toxins. So Go Ahead, Take a Sauna, You Deserve it! – It’s fast, fun and relaxing. Not only that, it’s good for the body, soothes the mind and can improve your overall health and well-being. To encourage local residents to check out the benefits of using a sauna to help improve their overall health and well-being, Hot Spring Spas is providing free sauna test soaks. We do recommend, however, that people wanting to schedule their free 30-minute test call us ahead of time to reserve their spot. To learn more about the benefits of owning a sauna, pick up a copy of our free buyer’s guide, Sauna Buying Made Easy. 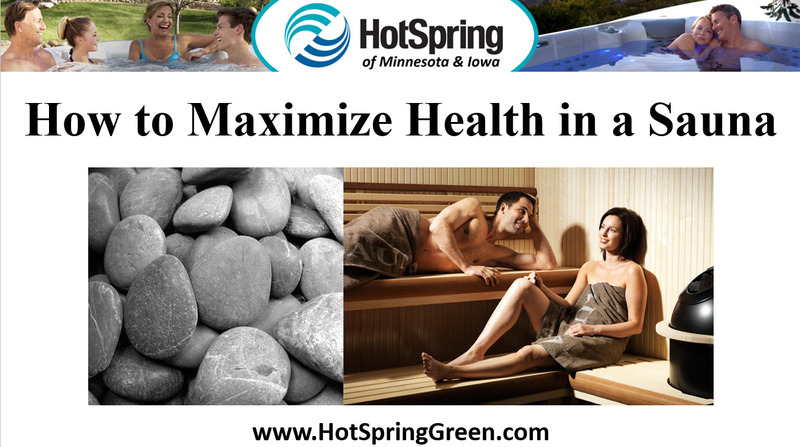 Just give us a call at ☎ 651-731-9745 or visit our website at: https://hotspringgreen.com/all-guides/.